I left this morning without having eaten breakfast and without a packed lunch for the first time in months, I think. I’m quite sure it’s happened, but I can’t remember a recent work/school day that I’ve been completely unprepared for both meals. I definitely didn’t set myself up for a decent day – procrastinated and had to finish something up at the crack of dawn. I am a crazy creature of habit and HATE messing up my routine, but I did. I thought about fasting, but that’s laughable … at best. There is no way in hell I’d be able to function all day with no food. 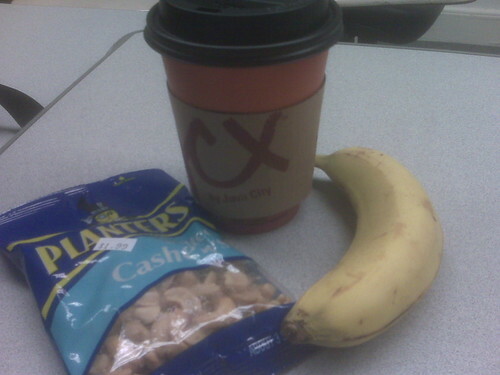 Breakfast ended up being a banana and some (oily) cashews from a small store on campus. This store, I should add, is FULL OF JUNK. Seriously – never seen anything like it. I try not to be judgey – I really don’t care what other people eat – but GD. The options (for ME) were VERY limited. The person in line in front of me had a sausage biscuit, a cup of donut holes and a coke. I went to Subway for lunch and got a salad. 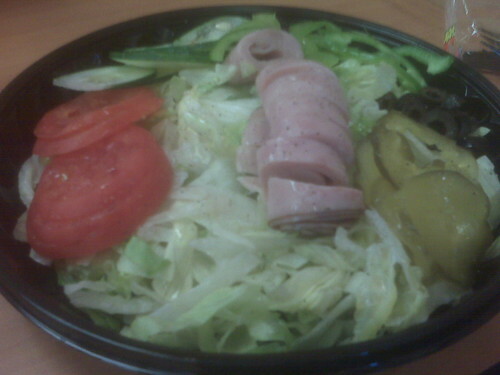 I think it was lettuce, ham, tomatoes, cucumber slices, olives, pickles and some oil and vinegar. I forgot to ask for cheese. It was pretty much pure hell to sit in there and smell the baking bread, but whatever. I got over it. Jon made dinner. 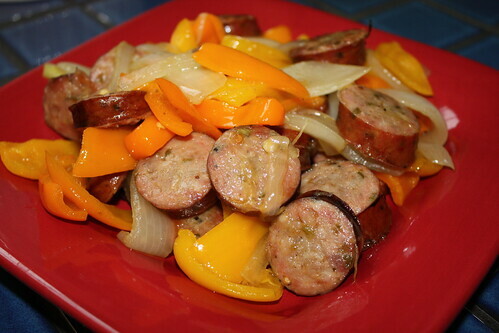 Peppers, onions and sausage – definitely our go-to meal when we’re tired and busy. I think I’m going to have some yogurt and fruit later – just seems weird to skip it entirely.